Orthopedic surgeon Dr. Bernard Cahill, specializing in sports medicine and research for 20 years, put Peoria on the Olympic Games map in 1992 after years of dedicated effort to make central Illinois a part of the U.S. Olympic training scene. The culmination of years of planning and dedication was climaxed last spring when the United States Olympic weightlifting team was selected during competition with several other nations in Peoria. Twenty-five years ago, sports medicine was a lot of talk. Today, sports medicine pioneers such as Dr. Cahill can take credit for faster, more complete recoveries by athletes and the general population alike. 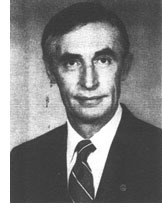 Dr. Cahill worked to establish the Great Plains Sports Medicine Science/Training Center, and has devoted much of his career to the wellbeing of youngsters. Respected for his knowledge and work with sports medicine throughout the world, Dr. Cahill is clinical professor of Orthopedics at the University of Illinois College of Medicine in Peoria and an ad hoc professor of sports medicine at Illinois State University. He is a founding member and immediate past president of the American Orthopedic Society for Sports Medicine, a member of President Ronald Reagan's Council on Physical Fitness and Sports and chairman of the American Orthopedic Society for Sports Medicine Asian Fellowship Program. Front row, from left, Bonita Harris, Chris Woertz, Megan Lanham, Jill Higgs, Juli Micek, Dr. Art Biggs. Back row, from left, Coach Lorene Ramsey, Asst. Coach Julie McGhee, Daryl Strong, Laura Trantina, Wanda Ervin, Margaret Humphrey, Michelle Dedin, Tammy Wilkinson, Asst. Coach Tom McGhee, Team Manager Shawn Lohnes. Not in photo, Nicole Pittenger. Lorene Ramsey, one of the nation’s most successful women’s basketball coaches, won the first of five National Junior College Division II titles as her Cougars produced a win to cap off the 1991-92 season. 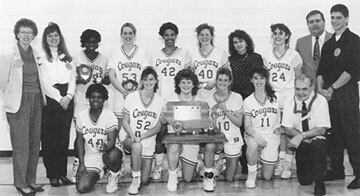 The 1991-92 Cougars were ranked eighth nationally and owned a 26-7 record moving into the national tournament in Bismarck, North Dakota and were working on an eight-game winning streak. As things turned out, they had trouble only in the first game, edging past state foe Kankakee 75-74. After that the team rolled over Lackawanna, Pa., 102-73 and then bombed Lansing, Mich., 89-72 for the national crown. Daryl Strong of Peoria Manual was named the Most Valuable Player of the tournament and, along with Tammy Wilkinson of Morton and Laura Trantina of Washington, made the all-tourney team. Wilkinson and Trantina were also named NJCAA all-Americans. Ramsey was named National Coach of the Year by the NJCAA and also selected as Tri-County Female Coach of the Year.